Of the five senses, a parrot's eyesight is his most acute sense. He will see all the same colors humans see, but with greater vividness and a more stark differentiation between similar colors. He can see colors in the ultraviolet spectrum that humans cannot, very similar to a human using a black light in a dark room. To understand how vividly colors appear to parrots, it's important to understand the differences between a parrot's eye and that of a human. In the human retina, three types of cone cells act as color receptors for red, green and blue objects. A bird's retina contains a fourth type of cone cell for detecting ultraviolet light. Each cone cell has a drop of colored oil that enhances the colors a parrot sees, and acts as a lens to create better differentiation between colors. For example, yellow oil will remove blue background colors, allowing more contrast between an object and the blue sky. Red oil removes green from background colors, enhancing contrast between objects and trees or bushes. Some species of birds look sexually monochromatic to the human eye, meaning it is difficult for us to differentiate visually between the males and females of the species. This is especially true with many parrot species. 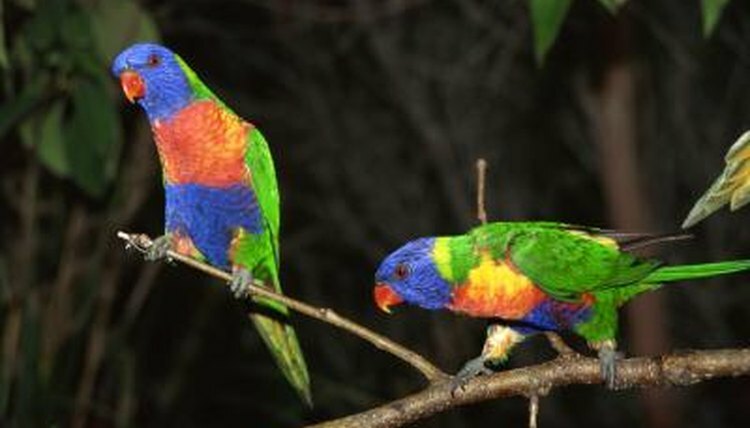 To the parrots, though, males and females look remarkably different from each other. A Swedish study at the University of Gothenburg revealed great differences in ultraviolet coloring among what appear to be sexually monochromatic birds. Males possessed reflective patches of feathers that could not be seen by the naked human eye, but when viewed through a special device, the difference in coloration was remarkable. Staffan Andersson, a professor of animal ecology at the university, found that females strongly preferred males with the brightest reflective feather patches. A Spanish study from 2007 revealed a group of baby birds had reflective patches of feathers on their foreheads that would exhibit a brighter reflection of ultraviolet colors when they were smaller or lighter weight than their siblings. Heavier chicks had duller, less vibrant patches. Parent birds would feed the chicks with the brighter ultraviolet patches first. Scientists involved in the study applied a sunblock-type lotion to some of the chicks, essentially dimming the ultraviolet coloration to the parents. Those chicks gained less weight than the unblocked chicks, implying they received less food because they failed to visually communicate their nutritional state to their parents. Other types of baby birds had vibrant ultraviolet coloring around their beaks. Such discoveries have led scientists to believe birds are able to communicate their hunger to their parents through visual cues using color. Many insects that birds prey upon have body coatings that reflect ultraviolet light. In addition to the more noticeable color contrast birds detect between bright berries and fruits and the green canopy of the trees, those fruits, berries and seeds develop a waxy coating that reflects ultraviolet light, making them easier for birds to locate. A parrot can peer into his food bowl and gravitate toward the tidbits that appear brighter and more colorful, even though those same morsels might appear fairly mundane to humans. Birds have a knack for associating certain colors in the ultraviolet spectrum with tasty treats. Bird Channel.com: Do Birds See in Color?